Somehow I’d forgotten that it had been almost a year since I convinced my friends Alex, Peter, and Nathan to spend a day blending and bottling my beers. I don’t think it is that hard to make a B+ sour beer from a single batch of wort, fermented in single fermentor, but doing better than that takes a lot of luck even for the best brewers in the world. The only way to consistently get terrific is to become a master of blending multiple batches together. Appearance – Reddish-brown, thin tan head. Aroma – Waxy, red berries (Irma), slightly boozy, and mild vinegar (Apple Brandy Golden). Taste – Balanced acidity (not much acetic) with some sweetness. It is slightly wheaty in the finish. Mouthfeel – Medium bodied for a sour beer. Medium-low carbonation. Drinkability – I like the flavor more than the aroma, overall a solid sour that grew on me as it warmed. Appearance – Burnt-orange, very poor head retention (and none of these beers are great). Aroma – Similar to Nathan's with its hints of acetic, but it has more oak. Cleaner with less overt fruitiness. Taste – The acidity is big and bright, only slightly acetic. The same balance as a good Flemish red, minimal funk. Mouthfeel – The oak adds more tannins than the other beers have. Drinkability – A more drinkable version of a Flemish red, crisper and drier. Appearance – The palest of the group, brilliantly golden. Aroma – The cleanest of the aromas, fresh hay, apple, and slight perfume. Taste – Bright snappy acidity, slightly stodgy malt, dry, I think it needs a boost from something. Mouthfeel – The crispest of the bunch. Similar carbonation to the rest, but it would benefit from more. Drinkability – I like this considerably more than Berliner lambic straight (we put half onto cherries too). Appearance –The darkest of the blends, brown with red highlights. Aroma – Big earthy buckwheat honey, almost as strong as in Dark Saison III, but it is muted somewhat. Taste – The flavor diverges from the dark saison, with a rounder, toastier flavor. Moderate sourness. Mouthfeel – The fullest of these beers, and the lowest level of carbonation. Drinkability – I like this quite a bit more than the straight Saison III. It has a better balance, and is easier to drink. So what did all of that blending and subsequent tasting teach me? There are definite thresholds where certain flavors cross from undetectable to prominent very quickly. My blend, despite only containing 7% more of the Dark Saison III than Nathan's, had a much stronger buckwheat honey aroma. Similarly it can take relatively small additions to correct perceived issues as with Pete's augmentation of the Berliner lambic. Especially when bottle conditioning trying to figure out how the beer will change is one of the most challenging tasks. I initially really liked Nathan's blend, but as time has gone on Alex's has caught up to and maybe passed it. It makes me appreciate the defense Lauren Salazar (New Belgium's blending guru) gives for the decision to pasteurize the "Lips of Faith" bombers of La Folie. However, despite the challenge and mystery of the blending arts, I think all four of us did a very good job on our first real attempt at blending these beers. None of the results are perfect, but I think all of them are better than at least some of their component beers. Hopefully I find an excuse to do something similar again when I have another round of sour beers ready to be bottled. I'd be interested in hearing about how you blended these with such specific percentages without introducing too many oxidizing variables. I haven't figured out a good way to blend that doesn't involve a lot of transferring around. Am i missing something, or why is the link about La Folie linking to "the great souring experiment" page? Sorry, fixed the link to Lauren's interview with Embrace the Funk. We used an auto-siphon, starting the outlet just barely above the level in the bottling bucket so the air in the line wouldn't bubble through the blend. A large capacity scale is the easiest way to measure out a blend, but we did it by volume (so the percentages probably aren't exact). Flushing with CO2 would be another good idea. Luckily Brett and bottle conditioning provide pretty good insurance against oxidation. I also troll a lot of the homebrewing forums as goat_power. Pretty sure we've talked on Northernbrewer. Anyways, keep up the good work. Looks like a good start! Glad you had good results with the D180, I brewed a quad with it yesterday. Haven't spent much time of NB recently, but I still get on Homebrewtalk when I need some inspiration. I agree that blending is very important for making high quality sour beers. However, your experiment differs significantly from a commercial operation. For example, Rodenbach doesn't blend totally different varieties, but rather blends different barrels of the same variety to create a more complex product. I'd be more interested to see how you blend different vintages of the same recipe to enhance the flavor/aroma profile. This is something I'm going to start doing in my own brewing. Blending, let's say, 1 year and 3 year vintages of the same beer to mix a maltier batch with a more sour batch. It is very hard to generalize how all "commercial operations" blend and isn't even exactly true for Rodenbach. Rodenbach actually brews two different beers, the young stainless steel aged beer that dominates Classic starts at 11P, while the long aged wood aged beer that makes up the majority of Grand Cru starts at 13.5P. Lots more information on their process is available here. Blending different barrels/batches of the same beer is done in the same way, you just have less variation to deal with. The goal is still to taste all of the beers and figure out what characters you want to highlight or obscure. I'll get a lot more practice when Modern Times is open and I have the luxury of dozens of barrels filled with the same wort! Up until now I've been too lazy to rebrew the same recipe often enough to generate enough stock to do this. 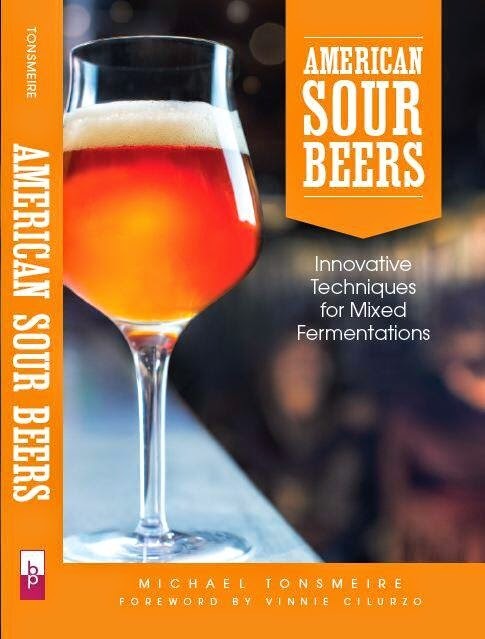 Mike, I am a longtime reader of your posts and I would like to thank you for your efforts to share your information and experience about sour beers. I learned so much and gained a lot of insight and inspiration for future batches. And I am going to buy a copy of your book for sure. Keep up the good work.